A new semester is about to begin (only 28 days from now) which means we will all be faced with the all too familiar challenge of figuring out how to stay on top of all of the tasks, assignments, papers, and exams that are about to fall on our plate! Whether you are a student or a professor, once the semester begins, so too will the deadlines - and they often come at us faster than we expect. It seems that we let ourselves ease into things throughout September, but before we know it, the Fall Midterm season is upon us, assignments begin to pile up, we get behind in our readings, and suddenly we are playing catch up - despite all of our best intentions. The challenge of staying on top of your work is not new to anyone, but sometimes it can help to seek out new solutions. The particularly difficult thing about tackling productivity is that the same solution will not always work for everyone. However, there are some "tried and true" methods that many find to be considerably helpful. I've tried many of them myself, and I often find that they work ... a bit, or they work... for a while. 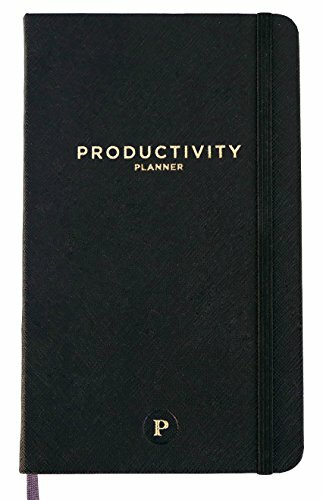 Two common suggestions that you'll come across online if you read anything about "How To Be Productive" are to get into the practice of making To Do lists and to use some kind of time management technique, such as the Pomodoro method. The people at Intelligent Change have taken these two highly successful methods of tackling productivity and put them together into a single Productivity Planner. Something about the sleek design of the journal, combined with the description of the features and timing method led me to impulsively purchase not one, but two of these planners a couple of weeks ago. (One is a gift - hopefully, the soon-to-be recipient does not read this!) So far, I've been absolutely loving mine and it has made a big difference in my "August Rush" productivity. The premise behind the journal is simple. Every day you write down up to 5 tasks that you'd like to complete, ranking them by order of importance. You start by working on the first task, and you do not move to the next until it has been completed. The key to picking your first task is to pick something that makes you feel slightly uncomfortable - but also something that, if you were to accomplish it today, you'd feel satisfied, even if you did not accomplish anything else. Next, you try to estimate how many 25 minute sessions (or Pomodoros) it will take you to complete the task - OR - if it is the kind of task that really cannot be completed in one day (e.g., studying for an exam), then you write down how many Pomodoros you want to devote to the task today. You do this for up to 5 different tasks, and suddenly you have a concise, manageable, and time-planed to-do list to guide the workflow of your day. For example, today, "Write 1 Blog Post" was my second entry, and I'm only now working on it after I already completed my first task of the on the list! 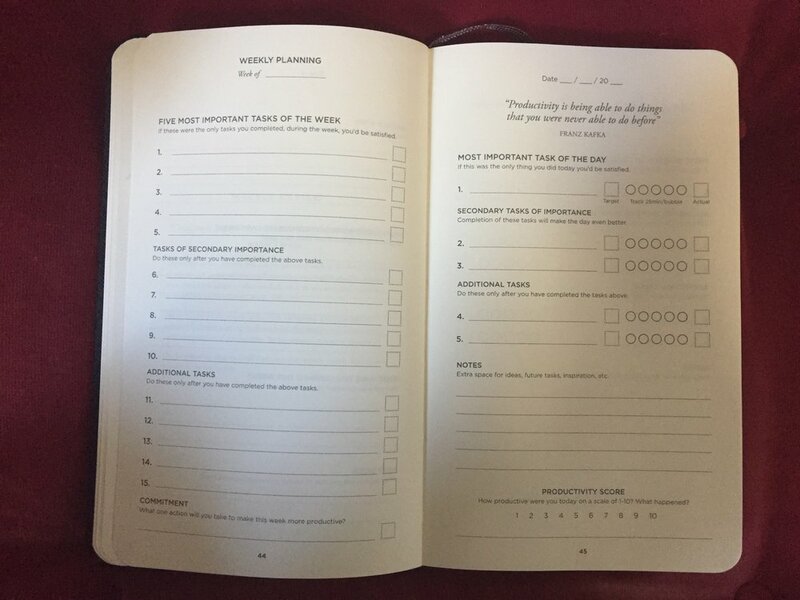 A snapshot of one of the Weekly Planning pages and a typical Daily Planning Page from the Productivity Planner. The next key feature is the Pomodoro Technique, which you can read about in many different places online. But, in sum, it involves working for brief periods of time - usually 25 minutes - on a SINGLE task, free from all sources of distraction (yes, that means you should Block Facebook and turn your phone to Do Not Disturb). When the time is up, you take a short break - 5 minutes. This should be a break from ALL work, not a break to check email or to do another task. It's time to get up, walk, play with the dog, make tea, or stretch. When the 5 minutes is up, another Pomodoro period begins. The journal lets you track your Pomodoros by giving you a place to "colour in" a circle each time you complete a 25 minute session towards that particular task (talk about satisfaction!!). When you've completed the task, you write down how many sessions it actually took you, so that you can compare this to your target and - over time - evaluate how well you are estimating the time requirements of your tasks. There are even weekly summary pages where you can keep track of what helped you to be productive over the past week and what got in your way. Of course, you do not need to buy a fancy journal in order to make yourself a to-do list or pace your focused work throughout the day. If you want to see if the Productivity Planner might work for you, you can make your own 5-item, prioritized to-do list and try it out for a day or two. You'll also want to download some kind of Pomodoro Timing App - there are plenty to choose from. I've been finding "Power Focus" to be very helpful, straightforward and easy to use. No matter what time-management or productivity solution you pick, the key to succeeding will always be commitment and consistency, along with a little bit of forgiveness. If you get off track or distracted, just start over again with the next Pomodoro session. If you mess up one day, don't throw out the journal the next. Whatever you pick, finding something that works for you could easily make the difference between earning a C average or a B+ average this year, so it's worth a little bit of time to investigate and find the option that will work best for you!